This is definitely one of my favorite videos, but I missed it because I never get to watch the late night shows anymore. James is adorable here, cracking a big smile and laughing, feeling comfortable enough to admit that he's uncomfortable. He seems to genuinely like talking to Fallon. I've noticed in the interviews I've seen that he looks and sounds nervous, having a lot of pauses trying to find the right words, or maybe it's just that he's thoughtful. Though he is an unquestionable genius playing roles, especially Raymond Reddington, he certainly doesn't clamor for the spotlight. The spotlight just happens to love him. Now that The Blacklist is a hit and has been picked up for a full 22-episode second season only half way through the first, I hope he can get used to all the attention. He's been in the business for a long time, but with everyone constantly connected now, there's more noise than ever and I'd think that could be overwhelming. I wouldn't want to think he'd feel awful every time he had to go on a talk show or to Comic-Con. Whatever the reason, if he has to overcome nerves, I'm glad he makes the effort. It's good to see him in interviews, outside of his character, though he himself seems to be quite the character. ;-) I said this is an interview I missed, but I've surely missed many. What I'd like to do is eventually put everything I can find in a clips/promos/fan videos/interviews page for the show. Edit 1/26/18: I've been going through all my posts finally giving the titles a single format, giving each show its own font, and replacing missing images that were on a service I no longer use. A few videos have gone missing, too, and I haven't been able to find this one on YouTube. 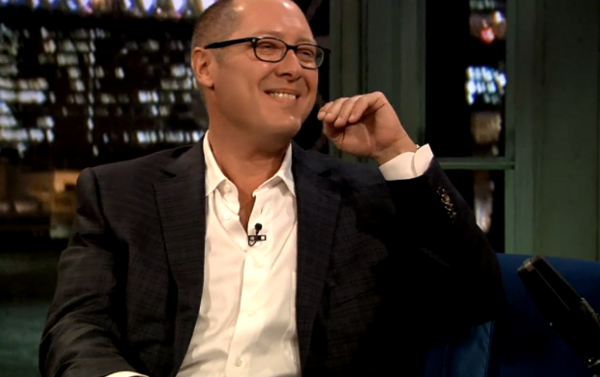 Always bet on Red - #TheBlacklist has been renewed for a full 22-episode second season!